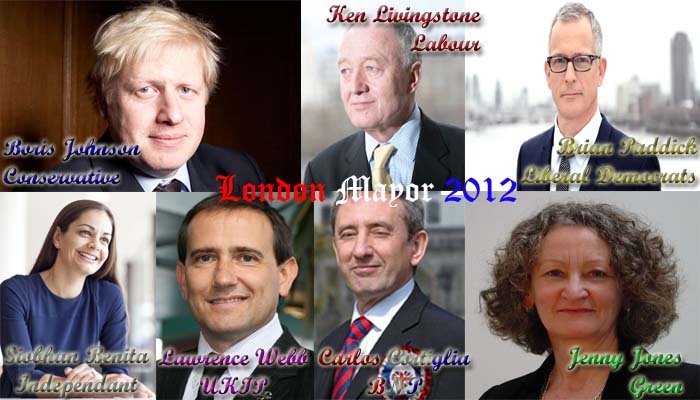 London Mayor 2012: Who to vote for? An early lead last week showed Labour candidate Ken Livingstone only behind by a minut number. So it seems the country/London are choosing Ken? Why would you vote for Ken? Boris Johnson for the Conservative party, also standing to retain his crown believes his main opposition to be a liar, having constant rows with him and dropping the fabled F bomb in a confrontation in a lift after a radio show near two weeks ago. Supporter of the labour party Lord Sugar even stated in The Sun newspaper last week that Ken was “egotistical” and felt to be a bad fit for the party as its main candidate. The reason Ken was chosen was because he was the only name who could possibly match Boris in terms of a political spectrum that is in an entertainment-esq field in terms of personality. I have a vote. I shall be voting. Who for? My original choice of Liberal Democrats Brian Paddick has waivered. As a student in his first year at a London University, coming from a poor background which Conservative’s would say is middle class to avoid helping my situation and unable to fund most things in my life. Whilst being skilled, yet unemployed, I have not cast him into the ‘Nick Clegg’ camp, which saw a backtrack on manifesto ethics on student fees. Asking Mr.Paddick on social networking site, Facebook for an interview some months ago, to drum up journalistic support for Bri wasn’t answered. His profile picture changed a day after. What it did signal to me was one thing. Not that I didn’t get an interview, but for the fact that it proved he wasn’t serious about his career as Mayor. I live in a poor household that is not my own, though our area is a Conservative led one, in North East London/Essex, just outside of London. Crime has started to increase, with next door neighbour burglaries and a string down our road. My father’s range rover was stolen at 4am in the night and possibly melted down for scrap. It was outside our front door. The police gave us some forms. Since, the police have not bothered to investigate and dropped the case in a disgrace of ‘support’. Boris claims he will change policing for the better. We never had much trouble at all in our area, though it seems the figures are slipping all over. My family are going to vote for Boris. Am I? Boris’ 9 point plan mentions nothing about fares and funding for students, let alone mature ones. Everyone loves Boris. I do too. He’s a real person, down with it and a right ol’ laugh. I love how he sticks it to everyone in his meetings at town hall. This is not a ‘vote for your mate down the pub’ moment though, is it? My choice is down to – Travel (Underground to London), Income/Job options. I am in the lines of media and Journalism, though most are not open for any ‘feet in the door’ so what are your options for me, other than to sit and fester into a pool of nothingness? I can contribute to London’s economy, create a new lease of life in Journalism and print media and many more, but I currently am further away from these options due to the government and the mayor of London. I cannot live near my Uni because they do not offer housing, which is shambolic. I can’t barely live outside of my parent’s house, let alone get a flat, nor even move to London closer to campus. These are fundamental issues that need addressing and given opportunity to help make tomorrow’s professional’s today. Ken Livingstone is a shrewd, cunning and dirty politician. He will do anything to win. He will cling onto any form of power at the last attempt. He is drab, monotone and annoying. He looks like he can’t be arsed. However, we do not need to like Ken. The job of mayor is to do the job and give the member of London and around/visiting the most cultural capital in all of the world the chance to live their life with chances to breakout of hardship and have help that supports people in London and allowing them to be re-humanised into living life and achieving goals, or even able to buy the weekly shopping at an affordable rate. I think, on Thursday 3rd May, I shall be voting for Ken! Ugh! Never thought I’d say it. Though Ken has shown to me he is more capable to do the job that I need to benefit me. Sure, he will probably put the fees he is decreasing by 5% up the next year, which you shouldn’t. Though I need to get to London and sort my life out! I am broke and have no career. I am studying part time and full of stress and hardship. Do I really need ever more problems? No. It will always come down to when you’re at the polling booth. I may change my vote, but currently I am at an 85 – 90 % red favoured vote. In the last election I voted yellow. If Boris can pledge to decrease fares in the next day then I will be able to change vote. Though I do not have that guarantee, do I? Whatever everyone votes for, make sure you vote! Women were not allowed, many died for it, and others who don’t vote allow your vote to automatically go to the party in power. I encourage everyone to vote in future elections against the big two parties fighting one another, though in this case, only those two have put manifesto’s forward that are in tune with Londoner’s needs and not what is best for London for people in Europe looking with neglect. 7 candidates are standing. 1 disgraceful party (BNP), a bigoted one (UKIP), some random lady (that’s how the public view it, not me), Jenny Jones for the Green’s (No-chance) and the main three. We would welcome any candidate willing to be interviewed here on the site, should you want to. Thank You, and happy voting! A note to all UK Tory’s after May’s catastrophic Brexit defeat. Time for GE.